Welcome to my first blog, ever! I’m not, by any means, a very affluent writer. I’m a little on the dyslexic side when writing and, admittedly, a little lazy when it comes to computers, unless of course it involves a good interactive video game! However, I am passionate about life, about riding, about adventures, about other cultures and, more than anything, getting to know and be part of the world around me. I love being engulfed by other cultures and the people who make up those cultures as well as the environment around me. My quest with blogging is to share those experiences with those who want to ride with me. Even if you’re an armchair rider, any ride is a good ride! Sit back and enjoy! If you’re on my route, which I should be presenting in more detail over the next few months, and would like to join, then give me a heads up and we can make plans. 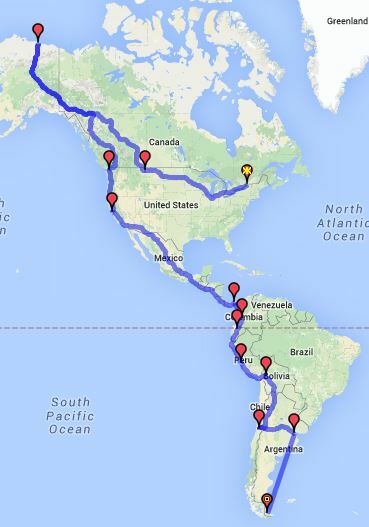 The blog is about my ride from Cornwall, Ontario, Canada to Alaska and then down to Panama. I will then slip into Columbia and ride down to the furthest point in South America, Tierra Del Feugo. Most of the ride, up to and including Panama, will be spent riding most of the time with short stops and visits along the way. When I reach Columbia, I plan on changing the speed and course of the trip. I will still be spending days and possibly weeks driving, but spending longer rest over times in certain areas. I have plans in place to volunteer in Columbia while looking for other opportunities along other routes while spending more time with the people, practising my Spanish and becoming more engulfed by the cultures. Please feel free to send me messages along the way. Don’t be shy, I thrive on other people’s input! Please don’t forget to go the “DONATE” button on my page, by doing so, you can help make a difference in someone else’s life. I will enjoy following you on your adventure and when you pass my cabin in the far Northern part of Alaska stop in refresh and say hello. Best of luck for a safe and rewarding adventure. Thank you so much for that offer Pete. The offer is first invite I have had on my blog and it excites me to me people from places I have never been. Please keep up with my blog. When I start posting of places I will be a long the route let me know when I am passing by. I am also willing to travel far outside my route to visit others. Where are you in Alaska Pete? Hopefully in the next year we can meet. Have yourself a Very Happy New Year, and all the best ot you and yours..